President Donald Trump loves his crowds big and beautiful, boisterous and larger-than-usual. He likes the nice surprise they present around every corner. But it was a very specific crowd that awaited him at Suffolk County Community College on Friday: one made up almost entirely of uniformed police. They lined the stage behind him, their white-gloved dress-uniform hands folded. They sat in the small auditorium in front of the podium. They were guests from out of state, federal officers from U.S. Immigration and Customs Enforcement, and local cops from Suffolk County, some of them actively engaged in the fight against the violent MS-13 street gang that has killed 17 Long Islanders within a few miles of where the president was about to speak. As expected Trump praised their work on that front, which has helped to prevent that vicious gang’s crimes and bring criminals to justice. But then he went further: encouraging officers “not to be too nice.” To be “rough” when throwing someone “into the back of a paddy wagon.” When they were pushing a suspected killer’s head into the squad car with a hand over the perp’s head, don’t worry about hitting the head. “You can take the hand away,” Trump said. 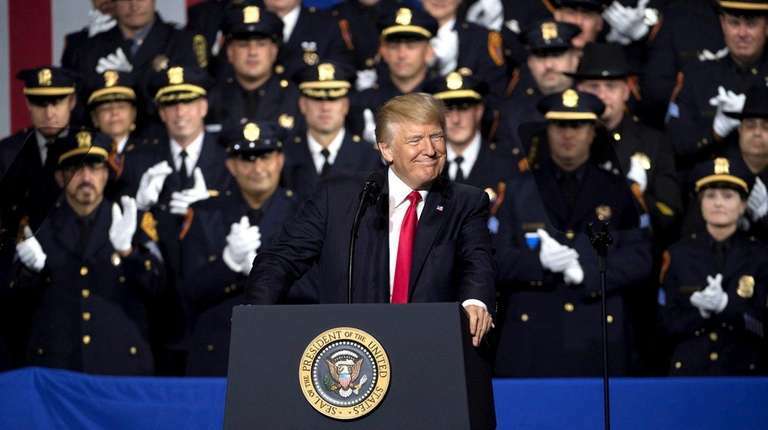 Watch President Trump's speech on LI President Donald Trump is visiting Long Island today, speaking to local law enforcement officers at the police academy at Suffolk County Community College in Brentwood. The president is expected to focus his remarks on the rash of gang violence Long Island has been experiencing at the hands of the MS-13 street gang and national immigration policies. Leave aside the crude cops-and-robbers understanding of police work and the vehicles they now use that this suggests. Forget that Trump was suggesting behavior that, if caught on body-camera or bystander video, might get an officer fired. Let’s pretend that Suffolk County’s last police chief wasnt convicted in federal court for beating up a guy who took a gym bag from his car. It was rhetoric as usual for Trump, who has been suggesting rough behavior verging on illegal violence during the campaign, when he promised to pay legal bills for supporters who roughed up protesters. But the moment and its reception was still disturbing. The room filled mostly with sworn officers of the law applauded loudly. It’s no surprise that many police officers vocally supported Trump, who dusted off the phrase “law and order” from the campaign. Trump’s Blue Lives Matter became the rallying cry antithesis to Black Lives Matter. Chief Thomas Boyd of Seaside Heights in New Jersey said Trump understood the daily bravery and challenges of the police officer: running into a robbery or a burning house. The stuff about knocking perps around? Just a “euphemism,” or “semi-joke.” Boyd said his officers know not to do anything like that during an arrest: His officers do the bare minimum to get someone under control and nothing more. All the officers there know the law on that count. So why the apparent excitement when Trump encouraged them to test the law’s edges? Perhaps because some cops are fed up with the political correctness, the public attention, the cell-phone cameras on their every move. It’s true that such attention might be stressful, but it comes for a reason. Baltimore’s police department is operating under a federal consent decree not for the fun of it. Twenty-five-year-old Freddie Gray of that city is dead because someone took the hand-off-the-head action to an extreme and bounced Gray around to his death in the back of a police van. Trump’s speech was unremarkable, his usual brand of dark foreboding and almost comical digressions. He couldn’t even stay on the topic of law enforcement’s good and necessary work against MS-13 earlier this month — 15 gang member arrests — insultingly diverting into the wealth of his friends, his building ability, and the size of his crowds. But the encouragement for police officers to do what they know is wrong — to disregard the laws they uphold — was a dark moment all its own. And for that crowd, a particularly concerning note. Mark Chiusano is a member of the Newsday editorial board.